Jordan is a constitutional monarchy, with its King holding most of the political power. The parliament is elected by the people, but proper campaigning has been difficult for opposition parties due to the country’s electoral laws. Since several reforms, elections became fairer and freer, as seen in the 2016 parliamentary elections. The candidates in the election stood mostly as independents, though the new election law made it also possible to run via party lists. The results showed most of the candidates elected in the 130-seated parliament were loyal to the government. The Islamic Action Front formed a broad coalition including Christians and Circassians. This "National Coalition for Reform" won 15 mandates, much lower than the expected 20-30 seats. The percentage of government critics in this parliament is lower than previously. Also the voter turnout was much lower with only 36,1%, arguably because registration was not optional. The voting was observed by thousands of local and international observers. They reportedly noticed the still existing restrictions on media coverage and journalism, especially through laws and intimidation. The judicial system in Jordan is not independent and does not align with international standards. Foreign relations of the country are pro-Western, perceivable through the country’s historically close relations with the US and the UK. It is part of the Arab League and has signed several peace agreements, as for example the Washington Declaration, a non-aggression pact with Israel. Other challenges for the country include the rising presence of refugees from neighbour Syria and the regional instability. Want to get notified by mail when Jordan gets updated? 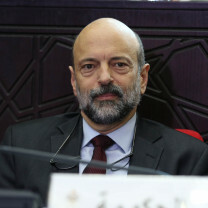 Omar al-Razzaz, born in 1960, is the current Prime Minister of Jordan. He was appointed by King Abdullah II after former PM Hani Al-Mulki resigned after days of widespread protests over a controversial tax reform. Al-Razzaz previously held the post of education minister. He oversaw reforms to overhaul Jordan’s traditional state education system. Before his government carrier he served with the World Bank in Lebanon as director. Razzaz holds a PhD from Harvard university in Economics. The Hashemite Kingdom of Jordan holds a strategic location in the Middle East, sharing borders with Saudi Arabia, Iraq, Syria, Israel and the West Bank. Since Hussein bin Talal became King of Jordan in 1952 democratic institutions were introduced. After his death in 1999, Hussein’s oldest son, Abdullah, succeeded him. In his position as Chief of State, Abdullah II has followed a policy of continuing his father's paternalistic style of rule from a moderate, pro-Western political viewpoint, claiming to gradually evolve the political landscape in Jordan from an autocratic state into a democracy with political pluralism. However, this notion is fiercely contested by the opposition, which regards the King’s policies as anti-democratic and speaks of a deteriorating political situation. The extensive history of clans and tribes that traditionally comprise the majority in the parliament and the lack of freedom of press are among the main challenges that hinder a democratic reform in Jordan. At the same time, the protracted people’s unrest against rising prices, corruption, and unemployment, inspired by the revolutions in Tunisia and Egypt and calling for the genuine constitutional reform, has challenged the Hashemite Monarchy’s order. Furthermore, protesters have been demanding full rights for women and calling for gender equality. Jordan is a constitutional monarchy with a legal system mixed of Islamic law, codes instituted by the Ottoman Empire (which are based on French law) and British common law. The constitution was first proclaimed on 8 January 1952 and has since been amended several times to meet the Kingdom’s changing needs. The government consists of the Chief of State (the King), the executive Prime Minister and Council of Ministers, and the legislative National Assembly with two chambers: the House of Deputies and the Senate. The King has the main power in Jordan and the monarch’s function is hereditary. The monarch has the power to appoint the Prime Minister as well as the Senate and to dissolve the House of Deputies at any time. Furthermore, the King is not obliged to appoint a Prime Minister or form a government from either the majority party or the parliament and currently prefers to rely on his own loyal supporters instead. Besides, the King signs and executes all laws. He appoints judges and may dismiss them by decree, as well as he may approve amendments to the constitution, declare war, and command the armed forces. His veto power can only be overridden by a two-thirds vote of both houses of the National Assembly. There has been sharp criticism levelled at Abdullah II that he and his Jordanian regime restrict freedom of speech due to his amendment to the Jordanian Penal Code, to ensure the legislation of the punishment of all those who express dissent. Human rights organizations have criticized the King and his regime for several human rights violations and acts of torture committed against Islamic radicals and those who express dissent and criticism over his policies. The 2011 people’s unrest characterized by relatively peaceful demonstrations have challenged the power of the throne by calling, in particular, on the King to relinquish his power to appoint prime ministers and to provide the parliament with more functions. The Prime Minister (PM) is appointed by the King and does not serve a fixed term. After the King’s mandate, the Prime Minister has the highest executive role. The Prime Minister has one or two Deputy Prime Ministers under his lead and forms the Cabinet in consultation with the monarch. As Jordan lacks organized political parties which enjoy parliamentary majorities or form coalition governments, the monarch usually picks up PMs out of people with distinguished records in the public life to form the cabinet. Over the last decade, the King has changed the government many times. Samir Rifai was appointed as Prime Minister on 2 December 2009. In January 2011, following large popular street protests organized by Islamic and leftist groups and inspired by similar demonstrations in Tunisia and Egypt, Samir Rifai resigned. The protesters accused PM Rifai of being insensitive to their economic hardships. Rifai was replaced by Marouf Bakhit, a former Prime Minister, who was also a prominent figure in the peace process between Israel and Jordan, which led to the 1994 peace treaty. However, his government failed to tackle a number of important domestic policy areas. On 16 October 2011, Awn al-Khaswaneh, a former royal court chief and legal adviser to Jordan's peace negotiators, was appointed to replace Bakhit as Prime Minister. After Awn al-Khaswaneh on 26 April 2012 resigned out of discord with the King on the pace of reforms, Fayez Tarawneh was appointed to take over his position. After the general elections in January 2013, King Abdullah II reappointed Ensour as Prime Minister on 9 March 2013. He was succeeded by Hani-Al Mulki at the beginning of June 2016. Mulki was also appointed by the King to head the government after the elections of 20 October 2016. Having to manage Israeli-Jordanians relations as one of his biggest challenges. When Mulki introduced a new tax law in May 2018, big protests erupted in the whole country, which in the end forced him to resign. The current prime minister is Omar al-Razzaz. The Upper House or Senate (Majlis al-Ayan) forms one half of the national legislature, the other being the House of Deputies. The Senate consists of 65 seats and members are appointed by the monarch from designated categories of public figures and long-serving politicians. The required age for membership is 40 years and none of its current members are associated to any party. The Senate advises the House of Deputies on general policies and together the two chambers can curb the King’s powers. It is in general a respected institute, with a large influence in the public domain. Membership term in the Senate is four years, renewable by the King. Current president of the Senate is former prime minister Faisal al-Fayez. The House of Deputies (the House of Representatives) is the only political organ that is directly elected by Jordanian citizens through universal adult suffrage, which is not guaranteed by the constitutions and restricts citizens who are disabled or bankrupt from voting. It is elected for a four years term, unless the monarch dissolves it earlier. From a total of 130 seats, 9 for Christians candidates, and 3 for Jordanians of Chechen or Circassian descent, according to the enacted Electoral Law of 2016. Furthermore, 15 seats are set for female representatives. The parliament has the right to approve, reject or amend legislation proposed by the cabinet. However, it is limited in its ability to initiate legislation and it cannot enact laws without the assent of the Senate. Most of the representatives in the House of Deputies are not affiliated to a political party. This is a result of the clan history of the country, combined with the long period in which political parties were illegal. Political parties were abolished in April 1957. Only in 1992 Jordan returned to a multi-party system with a new Political Parties Law. In 1993 a single-member-district system was introduced, favouring tribal and family ties over political and ideological affiliations. The current speaker of the House of Deputies is independent politician Atef Tarawneh. After a period of 22 years, in 1989 the first elections were held in Jordan under King Hussein’s rule. The official ban on political parties from 1957 remained, but candidates ranged ideologically from the extreme left to the extreme right. Most of these independent candidates formed loosely organized blocs. Analysts state that these blocs were predominantly organized along tribal and family ties, instead of along political or ideological affiliations. Nevertheless, Islamists won 22 out of 80 parliamentary seats in the 1989 elections, a fact that motivated the King to initiate a policy of electoral de-liberalization with the aim of decreasing the influence of Islamists on Jordan’s politics. Thus, a new 2001 Election Law introduced a controversial ‘one man, one vote’ electoral system, known as ‘single non-transferable vote system’. This system envisaged the redistribution of parliamentary seats, meaning that citizens vote for one candidate in their own district, with seats being awarded to the highest-polling individual candidates compatible with the number of seats in the district. In 2010, a new temporary electoral law was unveiled, designed to set the ground rules for the 2010 parliamentary elections. It preserved the ‘single non-transferable vote system’ and changed the current electoral districts to electoral "zones", each of which is broken down into multiple sub-districts. On 22 June 2012, after heated debates in Jordan's parliament, the first permanent election law since 1989 was approved by a Royal Decree. Each voter was given two votes, one for a candidate at the district level and another for the closed proportional list. Compared to the former ‘single non-transferrable vote system’, this system created a new electoral culture because each voter was able to pick a list of five candidates in his or her constituency. During the run up towards the 2016 parliamentary elections a new Election Law was introduced. The controversial one-person-one-vote system was replaced with a list-based system designed to encourage political parties. Another new aspect in the law is that registration for the elections is not optional. Therefore, the number of eligible voters rose from 2,288,043 in the 2013 elections to 4,130,142 in 2016 (policy of active voter registration instead of passive voter registration). In addition, the introduction of the Election Law saw a reduction in the number of seats in the Lower House from 150 to 130, while the women's quota remained at 15. The 2016 Election Law has been criticized for leaving intact a voting system that favours sparsely populated tribal East Bank constituencies over the densely populated cities mostly inhabited by Jordanians of Palestinian descent, which are Islamic strongholds and highly politicized. For example, in one constituency in the city of Zarqa, 450,000 eligible voters who usually back Islamists have only six parliamentary seats. By contrast, in the southern tribal town of Maan, 59,000 voters choose four members of parliament. More than two-thirds of Jordan’s seven million people live in cities but are allocated less than a third of assembly seats. On 20 October 2016, parliamentary elections were held in Jordan. The candidates stood mostly as independents, their loyalties rooted not in political parties but in tribal and family allegiances. Results showed the main opposition party, the Islamic Action Front based National Coalition for Reform, gained 10 seats. Five other political parties won 32 seats, including the Islamist Wasat (seven seats), Zamzam (five seats), the National Current Party (four seats), the Justice and Reform Party (three seats) and the Arab Ba’ath Progressive Party (two seats). Lastly, the Jordanian United Front, Al Wafaa, Al Awn and Al Resalah parties won one seat each. All remaining seats went to non-party affiliated candidates. As had been the case during the past two decades, the majority of the newly elected MPs were either individuals with tribal affiliations or businessmen. The percentage of government critics in this parliament is lower than in the previous. The voter turnout was 36,1 percent, with the voting being observed by thousands of local and international observers. The Independent Elections Commission (IEC), created under the Electoral Law in 2012, was appointed to observe and supervise the parliamentary elections for the second time, in order to guarantee free and transparent elections. Observers stated that the turnout for these parliamentary elections was 37 percent at the national level, with Amman recording the lowest at around 23 percent and the Southern Badia the highest at around 84 percent. This was considerably lower than the previous elections in 2013. Observers from the European Union Election Observation Mission (EU EOM) said it was a well administrated election, although room for additional improvement of the legal framework remains. In particular respect for key principles, such as the universality and equality of the vote, and the right to stand as candidate could be further enhanced. Furthermore, under the current districting, large urban areas are underrepresented and sparsely populated or rural areas are considered overrepresented. Overall, the campaign was peaceful, with isolated reports of minor campaign related incidents. There was considerable campaigning outside the polling stations on the election day, which is not in line with the law. Opening and counting proceeded peacefully and calmly and voting was generally well organized in 441 out 459 polling stations visited. Although no specific restrictions on electoral media coverage were observed, Jordanian media operated in an environment considered as partially free. The current media legal framework, restrictive and at times vague, results in self-censorship. Nonetheless, Freedom House graded Jordan from ‘not free’ to ‘partly free’ due to its observations at the 2016 elections. New during this election was the participation of the Islamic Action Front (IAF), the political arm of Jordan’s Muslim Brotherhood and Jordan’s main political opposition. It boycotted the last two elections to protest against the previous election laws. This year, it decided to participate in the election because of the introduction of the party lists. It formed 20 lists running under Al Islah bloc, or the National Coalition of Reform, which includes Christian members of other political parties and tribal leaders. The Coalition managed to get 15 seats in the newly elected parliament, though it is unlikely that representation of the IAF (10 seats) is going to cause any dramatic change in the country’s political atmosphere. The comeback of Jordan’s best organized opposition has left secular rivals fearing the revival of Islamism in a contest where national politics has taken a back seat. They have responded by demanding the separation of politics and religion and attacking political Islam. 20 women won seats in the parliament. Of these women, 15 won because of the state-set quota for women. The other women won their seat by defeating their male candidates. The Christian minority has 9 state-set seats, while there are 3 seats reserved for the Circassian and Chechen communities. It is widely believed that the King only introduced the quotas to show the world its progress. But still, many female candidates are not only supported but also heavily guided by their family or the group they represent instead of setting their own agendas. The Jordanian Social Democratic Party (JSDP) was formed by a loosely cooperating group of social democrats in Jordan. In March 2016 it was officially registered as a political party and joint the Arab Social Democratic Forum and the Progressive Alliance. Its main goals are to strengthen democratic values and the role of parties in Jordanian politics. Furthermore it wants to promote dialogue between NGO’s and the government and stands for problem solving through communication. In the 2016 elections, the party participated for the first time, but did not get any seats. Its campaign emphasized on social democratic principles like social justice and equality. The Islamic Action Front (IAF) was founded in 1992, at the very beginning of the renewed political party life in Jordan. It is the country’s largest party and it relies on a large grassroots support. The party has always had strong ties with the Muslim Brotherhood, the only political segment that was operating legally during the period of martial law. The Islamic Action Front’s principles are equal to those articulated in the Islamic law (the Sharia). Since its foundation the IAF has always had seats in the parliament, except for 1997, 2010 and 2013 when the party boycotted the elections. In 2006 a massive fragmentation of the IAF took place, which led to internal divisions. During the parliamentary elections of 2003, the party gained 18 out of 110 seats, in 2007 – 6 out of 110. IAF did not get any seats in the 2010 election as it boycotted the elections calling for the abolishment of the ‘one man, one vote’ electoral system. In the parliamentary elections of 2013, the party reiterated its former statement. In the 2016 elections, the party participated and gained 10 mandates for the Jordanian parliament, as part of the broad Coalition of National Reform. It is one of the only opposition groups in the region that does not call for a regime change. Zamzam or "National Congress Party" was launched in 2012 by moderate Islamists from the (Jordanian) Muslim Brotherhood and other political figures, who made proposals to address the challenges facing the Kingdom. The Zamzam founders say that they are trying to break down the duopoly of the regime versus the Brotherhood, which has dominated both local and regional politics, and create a third way towards achieving political reform. Zamzam was officially established as a political party in 2016. Leaders of the initiative described it as "civil, nonaligned, inclusive and of purely national goals resting on the principles of democracy and the rule of law". They also stressed that the party is "flexible and capable of attracting people of experience, beyond religious, ideological, geographical, tribal and political alliances". It could be seen as the former liberal faction of the IAF, while at the same time it has a more nationalist agenda. The Zamzam Party won 5 seats at the October 2016 elections. The Islamist Wasat Party was first given offical licensing by the Jordanian government in 2001, which was renewed in 2008 with the introduction of the political party laws. The party seeks to promote political, economic, educational and social reforms on the basis of Islamic law, though it does not see itself as a religious party. It specifically calls for the increasing role of women in Jordan. Target group of the party are members of the Islamic movement, though it is not part of the Muslim Brotherhood. The Islamic Wasat Party criticizes extreme religious ideologies that do not support pluralism and promote violence. In that respect, it is more moderate than the IAF. The party was founded in 2009 and emphasizes on strengthening the values of national belonging, political loyalty, equality, moderation, and tolerance as its goals. The party stands for a greated political reform via developing governance mechanisms as well as conciliation between security policies versus freedom and protection of citizens. National unity is stressed as the main objective. The National Current Party won 4 seats at the election of 2016. The Justice and Reform Party emphasizes on Jordan’s Arab heritage. It wants to keep Islamic values and teachings as part of the country’s society and politics. Securing Jordan’s independence and at the same time acknowledging other countries’ sovereignty belong to its main goals. It disapproves of intervention into politics of other, especially Arab, states. Established in the 1950s, the Ba'ath Arab Progressive Party was the strongest in Syria and Iraq. The party split into two competing branches, as it was re-formed and legally registered in 1993. The Ba'ath Party was from the beginning a secular Arab nationalist party. This ideological branch advocates pan-Arab nationalism and Arab unity. The party’s economic dogma “Unity, Freedom, and Socialism” are still the keywords. "Unity" refers to Arab unity, "freedom" emphasizes freedom from foreign control and interference in particular, and "socialism" refers to what has been termed Arab Socialism rather than to Marxism. The party won 1 seat in parliament in the 2016 elections. The Jordan National Union Party is a young, secular and democratic party, founded in 2012. Its goals are to establish the concept of democracy, to enable the parliament to do its duty in control and accountability legislation and to confirm the separation of powers and to ensure all kinds of freedom, like expression, assembly, the right to demonstrate and so on. The party won one seat in the 2016 elections. The Al Awn Party was established in 2015. The Secretary-General of the party is lawyer Faisal Al Awar. The party gained one seat during the parliamentary elections of 2016. The Jordanian United Front Party was was founded in 2007. 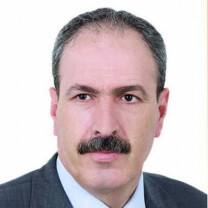 Current leader of this nationalist and loyalist party is Amjad al-Majali, a former government minister. Abdullah II bin al-Hussein, born on 30 January 1962, is the reigning King of the Hashemite Kingdom of Jordan. He ascended the throne on 7 February 1999 after the death of his father King Hussein. 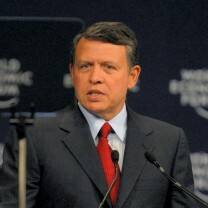 King Abdullah is of half-British and half-Hashemite descent. He was decreed Crown Prince on 24 January 1991. Given his mixed heritage, this was a contested decision. Nevertheless, Abdullah, who claims to be the 43rd generation descendant of the prophet Muhammad, became King Abdullah II, and is continuing the work of his father by investing in peace building. In 2010, King Abdullah was chosen as the 4th most influential Muslim in the world. King Abdullah is married to Queen Rania of Jordan and they have four children. Jamil Thalji Nimri was born in 1952 and holds a bachelor’s degree in pharmacy since his studies in Italy. Originally a journalist, he used to write for Al-Ghad news between 2005 and 2010 and analysed politics for the Al-Arab al-Yawm newspaper. Between 1996 and 2007 he also hosted a political talk show on broadcaster Jordanian TV. He is a founding member and spokesperson of the former Democratic Left Party in Jordan, but has joined the JSDP after its establishment. Nimri has been a member of parliament since 2010 as one of the by the electoral law predefined 9 Christians, but lost his seat after the elections of 2016.